Decatur County Amateur Radio Club - Welcome. Swap Shop page is back with items for sale, click here. Visit our Calendar page for a more detailed view of upcoming events. Refresh page if events are missing or do not display properly. The purpose and mission of the Decatur County Amateur Radio Club is to promote the hobby of amateur radio. 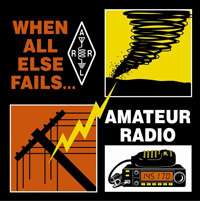 The club accomplishes this by assisting those who are new to amateur radio, offering license testing, and promoting fellowship among amateur radio operators. The club supports the Amateur’s Code of 1928.